For May, the monthly recyclable is Paper! 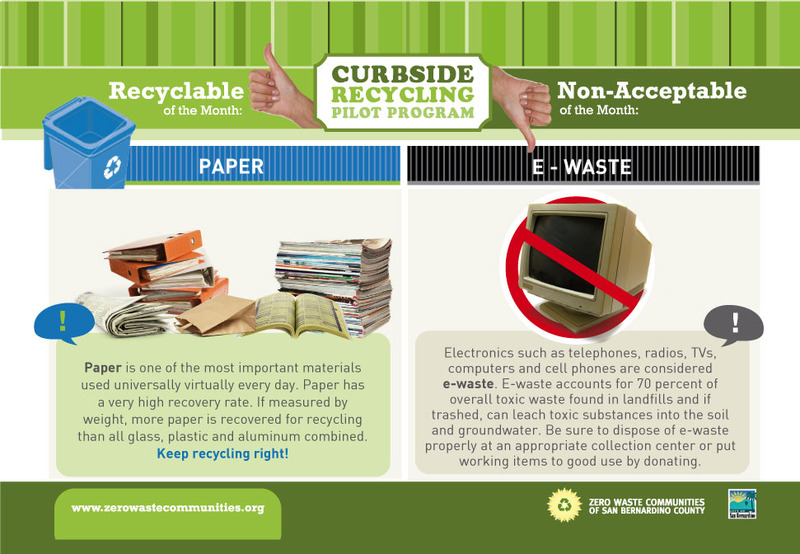 The Curbside Recycling Program wants to extend a reminder that it accepts all paper. Paper is one of the most important materials used universally virtually every day. Paper has a very high recovery rate. If measured by weight, more paper is recovered for recycling than all glass, plastic and aluminum combined. Keep recycling right! The monthly non-acceptable blue bin item is Electronic Waste. Electronics such as telephones, radios, TVs, computers and cell phones are considered e-waste. What do you usually do when you come across old electronics? What type of electronics become outdated quickly in your household? E-waste accounts for 70 percent of overall toxic waste found in landfills and if trashed, can leach toxic substances into the soil and groundwater. Be sure to dispose of e-waste properly at an appropriate collection center or put working items to good use by donating. You should have received your postcard reminder in the mail last weekend.